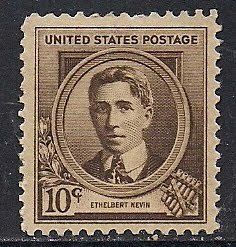 Ethelbert Nevin(1862-1901), American composer, studied piano in Boston and Berlin, voice in Dresden. He had a fine individuality of expression. He taught, studied, and composed in Boston and Europe for much of the first half of the 1890s. He concentrated on composing short pieces; composed mainly songs - "The Rosary", "Mighty Like a Rose", his songs achieved immensely popularity in his time.